REGISTER NOW to be part of this innovative conference focused on Leadership, Education, Advocacy and Discovery – LEAD. Join us for dinner at the Angus Barn Pavilion! One of the social events at the LEAD Health Care Conference in October. 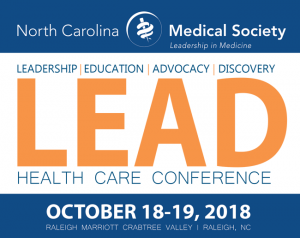 Stay tuned to www.ncms-lead.com and watch your email and mailbox for details on the LEAD Health Care Conference’s educational content, speakers and social events, including a Thursday evening reception to be held at the Angus Barn Pavilion. Interested in exhibiting at this year’s conference? Download an Exhibitor Prospectus or please contact meetings@ncmedsoc.org.